One thing that is always in style – every year – is t-shirts. Sure, the characters on them may change, but a t-shirt never goes out of style. (In fact, some of the most popular new items are simply a hat-tip to old t-shirts from the 80’s.) Let your child pick out a t-shirt for every day of the week, keeping in mind that they are most affordable at big box stores and when on sale at outlets. Give them life for the colder months by layering them with solid colored long-sleeve thermal tops, or wearing them under button downs. Girls can pair their tees with cute zip-up hoodies and scarves. The more layers, the more options, and each piece should run no more than $10 per item. Parents need to get real about what school supplies their kids will really need. Yes, the school may insist that only Crayola will do, but if you are sending your 5-year-old to his first year of school, will it matter if those crayons are generic? Also, kids younger than 8 or 9 rarely need things like protractors or binder clips. Pay close attention to the notebooks you pick up — college bound vs. wide ruled does matter — and leave the expensive graphing calculators to the later years. (I never even took a class that required one.) Forget the fancy binders (remember, Trapper Keepers), and equip your youngsters with basic pocket folders and paper. Most of it will get scribbled on, bent, or trashed by the first month, anyway. Since schools seem to provide less and less of their own supplies, parents will need to pitch in this year, as they have in all the previous years. Tissues, disinfecting wipes, sanitizer, and papers towels are becoming just as necessary as #2 pencils these days. Also, be sure to keep an eye on things that teachers don’t allow in classrooms; wheeled backpacks and mechanical pencils are just a couple of items that have been banned in some classrooms, and will be a waste of money if you fail to follow directions. A huge burden to families who prepare for back-to-school is items that get lost or stolen. Be sure to label all items you wish your kid to come back home with, including folders, toys, sports and musical equipment, coats, hats, and even shoes. As an aside, it is important to note that many schools ask that you NOT label the school supplies requested on the list. This is because many schools dump all the supplies brought in by students into a community supply closet. That being said, you should assume that by buying a more expensive pack of pencils, for example, you are essentially buying it for someone else’s child (or the teacher). Save money where possible! The preliminary list for the beginning of the year is a guideline for starting the season, but most classrooms require a continual replenishing of the supplies. For this reason, it’s important to stock up on the super sales that are going on right now, and stash extra crayons, markers, etc in a place that your kids can’t get to until they really need them. Don’t get tempted to break into the reserves until it is absolutely necessary; having to buy items when needed (as compared to when they are on sale) is one of the biggest ways to blow the budget. On the other side of the coin is the dilemma of buying items like kids’ clothing and shoes ahead of time, when they are on sale. Kids’ tastes change so quickly, and unless the child is younger and doesn’t mind wearing things a few seasons behind or can get away with something a bit loose-fitting, you will be wasting money by buying too far ahead. With the exception of families like ours (with four stair-step boys under age 7), feet grow, styles evolve, and things that can’t be handed down to younger siblings will end up wasting cash. 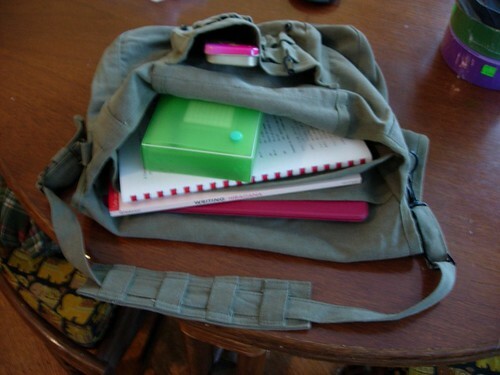 What tips do you recommend for busting the back-to-school budget? This year my daughter will be wearing uniforms, so that will save a big chunk of money and allow me to save hundreds of dollars. No supplies are required until the upper grades; however, I really like all of your great tips on saving and I will definitely take them up with the time comes! These are great tips, especially the hint about stocking up on supplies and storing them in your closet where your kids can’t find them. I think it’s also important for parents to understand that their children may want new clothes before school, especially if they’re entering those tender middle/high school years. Even though it’s silly to us because we’re older, it is important for them to fit in and look like their peers, even if we really want them to stand out. Bend a little bit and buy them those shoes they want or one or two pricey outfits to make them happy. At least offer to pay a certain portion and have them pay the rest with their own money. This is a really sensitive time in their lives and parents need to understand that. Don’t write their purchases off. You were a teenager once too!